Podcasting Bundle - RecordForAll and FeedForAll makes it simple to record audio files, layer audio files, edit audio files and publish podcast feeds. 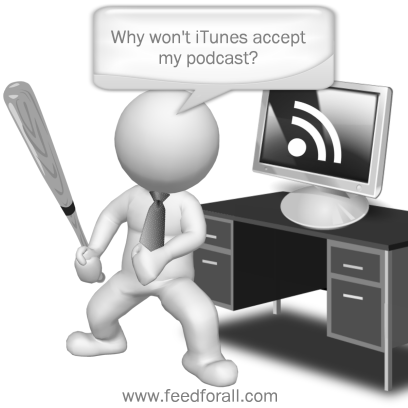 11/29/2013 Are Podcasts Less Profitable than Other Forms of Media? The business and sustainability of podcasting seems to be gaining momentum in the zeitgeist. The latest entry is an article in last Fridays Wall Street Journal that laments in its headline, So Many Podcasts, So Little Profit. Headphones can help you record and edit your podcast better. Picking the right headphones is a highly subjective process, but here are nine things you should consider before buying headphones for your podcast. 11/27/2013 Is Podcasting the New Blogging? It had me seriously considering starting a podcast for two reasons. One, I feel like hobby blogging about anything, but especially books, is going to become less and less common because people do not have the time anymore to read tons of blogs. So I wanted a fun way to bring my blog to more people. Recording devices take many forms, from really basic dictaphones to full-quality professional audio recorders. Most simply, your computer can act as a recording device – it is easily possible to record a regular podcast using no more than a laptop and its inbuilt microphone. But, when you start becoming a bit more professional, looking to improve both your sound and your workflow, a good digital recorder is a vital podcasting tool. When was the last time you hosted a podcast show on iTunes? The chances are your answer is probably never. However, for an increasing number of businesses and freelancers around the world, podcasting represents an unrivalled opportunity to grow their reputation and reach up to 500 million people. The Pulse podcast is a do-it-yourself guide to podcasting for the classroom. Has podcasting gone the way of audio cassettes, walkmans, and other obsolete ways to consume content? The answer appears to be a resounding no. In fact, podcasting appears to have usurped the roles of infographics and video among industry discussions of multi-media branded content. I was among the 1,100 attendees at the recent Social Media Marketing World 2013 convention, and podcasting proved to be one of the most-discussed topics at the event. Have you ever considered starting your own podcast? Podcasts can offer a great way of reaching your audience and providing more value for them. And the great news, anyone with a computer and Internet access can easily start their own podcast, with minimum spending and effort. Voting closes November 15th at 2100 EST. The 9th Annual Podcast Awards Ceremony will be Held at New Media Expo in Las Vegas on Sunday Jan 5, 2014! RecordForAll allows for you to easily record, and edit audio files for podcasts. You might not have thought much about podcasting – a lot of people saw this form of communications media as a passing fad and ignored its potential in the doing. In reality, podcasting can be a very useful tool. For those worried about the costs or hassles of production, there are ways to approach podcasting that eliminate or at least help to neutralize scheduling, budgeting, and production troubles. Creating podcasts is simpler than you might think – you don’t have to be an expert with a lot of fancy equipment to make a great podcast presentation. Podcasts are very convenient to use. They can be played in cars, at the gym, on the airplane. They can be listened to without an internet connection, but you do need an internet connection to download the files.